Some D.C. bars, restaurants and even a yogurt shop are hoping to lift furloughed workers' spirits with freebies and deals. Here are some shutdown specials. WASHINGTON — With the federal government shutdown, some D.C. bars, restaurants and even a yogurt shop are hoping to lift furloughed workers’ spirits with freebies and deals. Here are the specials that are confirmed to kick in. The Bird: Any furloughed government employee can enjoy “The Art of the Ordeal” — Korean wings with any draft beer for $8 during happy hour. China Chilcano: Government employees not being paid during the shutdown get a complimentary pan con pollo at the bar from 2 p.m. to 4 p.m. Monday through Friday. Capitol Lounge: $5 “shutdown cocktails” with colorful names like “C’mon Chuck” and “Durbin Soda” will be available for those who show a federal employee ID. Carmine’s: The happy hour menu will be offered all day in the bar as long as the shutdown continues. 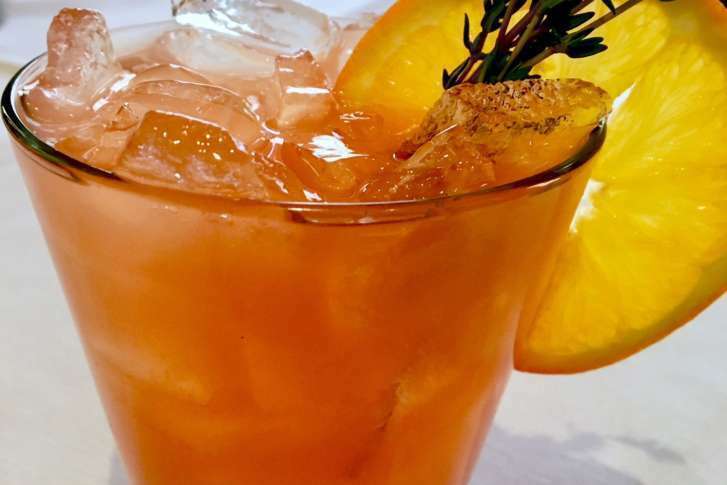 Everyone, not just furloughed feds, will be able to order a $12 “Hard Times Cocktail” made with Campari, bourbon, orange juice and thyme-infused simple syrup. Also: Order any happy hour item (like fried zucchini or meatball sliders), and they’ll throw in an extra meatball. CAVA: All furloughed federal employees get a 10 percent discount on single purchases of bowls and pitas during the shutdown (with a valid work ID, of course). The Commodore Public House: Offers $3 Narragansett drafts and an added shot for $3 more. DCity Smokehouse: Offers happy hour, every hour for all government employees with a government issued ID. dcWisdom: Extended happy hour with government ID every night of the shutdown. $2 off all house infused gin and tonics, $1 off all ciders/beers, wine and winter warmers, $6 off all rail drinks. Dino’s Grotto: Until the shutdown is over, it will be happy hour for government employees. Federalist Pig: Narragansett Beer is $3 with a government ID. Finn McCool’s: Enjoy happy hour prices all day and night, as long as the shutdown continues, with a valid government ID. Granville Moore’s: Federal workers who show their government ID can take 30 percent off drafts. Hawk ‘n’ Dove: A valid government ID gets you happy hour prices all day and night during the shutdown. Jaleo: Every D.C.-area location is offering a complimentary flauta de tortilla de patatas at the bar Monday through Friday from 2 p.m. until 4 p.m.
JINYA Ramen Bar: 50% off selected items for the first 100 federal employees, only at the 14th Street location in D.C.
Little Miss Whiskey’s Golden Dollar: For government workers, they’ll have $5 rail drinks and $5 tallboys of Bitburger Pilsner and Benediktiner Helles (both German imports). Lola’s: You’ll pay happy hour prices all day and night during the shutdown with a valid government ID. Mad Fox Brewing Company: All federal workers get 20 percent off food with a valid ID. The company’s Instagram post states that members of Congress will be charged 20 percent more. Menchie’s U St.: Furloughed workers who show their government ID will get 20 percent off. Merzi: Government employees who show their ID’s get a 20 percent discount until the shutdown ends. Ocean Prime: Happy hour menu begins early at 11:30 a.m.
Ophelia’s Fish House: Flash your valid government ID to get happy hour prices all day and night during the shutdown. Oyamel: Government employees not being paid during the shutdown get a complimentary cochinita pibil torta at the bar from 2 p.m. to 4 p.m. Monday through Friday. PB BBQ: Federal employees get a free pulled pork sandwich Monday – Friday. Pow Pow: Federal employees get a 25 percent discount on in-store purchases with show of government ID. Sugar Shack: This doughnut eatery in Alexandria and Arlington, Virginia, and D.C. is giving federal employees free coffee with any purchase as long as the shutdown lasts. Sweet Fire Donna’s: Starting Monday, non-working federal employees get a free pork sandwich if they show their government ID. The Pug: Police, firefighter and teacher 30 percent discount will be extended to federal employees. The Queen Vic: Drafts are 30 percent off for federal workers showing a government ID. Taylor Gourmet: Your valid federal government ID gets you 10 percent off your order (excluding online sales) at any location in the DMV. Three Fox Vineyards: Those affected by the shutdown get 15 off off on top of any other regular discounts. Tio Javier: Throughout the shutdown, all day and night, you’ll pay happy hour prices when you show a valid government ID. Tryst: A government ID will get you 10 percent off at any of Tryst’s six restaurants during the shutdown. Tyber Creek: To “celebrate” the shutdown, there is extended happy hour pricing with a government ID. Willie’s: Your valid government ID earns you happy hour prices all day and night during the shutdown. Zaytinya: Government employees not being paid during the shutdown get a complimentary chicken shawarma at the bar from 2 p.m. to 4 p.m. Monday through Friday. Z-Burger Tenleytown: 11 a.m.–4 p.m. Monday, government workers get a free single burger when they show their government ID.